Another MicroWriter ML has been installed in China. The National University of Defence Technology (NUDT) in Changsha recently took delivery of the machine. 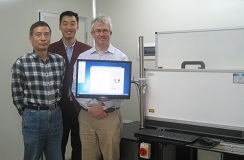 Equipped with the 0.6um laser option and an infrared imaging laser for backside alignment, the machine will be used in a variety of projects within the Department of Computer Science.